The beginning of a new year sees many people rushing to make resolutions; promises they make themselves and others about changes they intend to make moving forward. Often times, those resolutions are around health and health behaviours. But, as anyone who has ever made a New Year’s Resolution can tell you, veryfew resolutions see the light of February. Some health resolutions fail because they are doomed from the start. If you make a resolution to ‘get healthy’, but measure your success by the scale, then what you’re really focusing on is weight loss, not health. And once that scale stops moving in the direction you want, at the speed you want, you may give up the health seeking behaviours and walk away from your resolution. In the United States, the National Weight Control Registry tracks over 10,000 people who have maintained a weight loss of at least 13.6 kilos for one year or more. To put this into context, 108 million people in the United States are dieting on any given day, and the diet industry is worth $61 billion. The failure of weight loss attempts (behavioural, surgical, lifestyle changes) is well documented in the empirical literature. Scientists, researchers, and doctors, alike, have failed to discover a way that produces a meaningful (more than 10 kilos) permanent (lasting longer than 5 years) method of weight loss. There are many suggestions for why weight loss is unachievable for 95% of those who attempt, including genetic and physiological. Luckily, there is evidence that weight loss, or being a ‘normal’ weight, is not required for good health. For example, engagement in physical activity is documented to be more important for health than weight, with physically active fat people reporting better health than non-fat people who are not physically active. Health at Every Size (HAES) is an emerging medical paradigm that proposes that all bodies, regardless of size, may engage in health seeking behaviours. It argues that weight is a poor proxy for health, and that instead of striving for reduction in weight, individuals should focus on engaging in health seeking behaviours, and be mindful that health is tied to more than just diet and exercise. Research using this paradigm has demonstrated increased health outcomes independent of weight loss. Approaches such as HAES allow for positive health outcomes, free from the common consequences of weight loss attempts such as food preoccupation, repeat cycles of weight loss and gain, and reduced self-esteem. Repeat cycles of weight loss are also a risk factor for overall health and mortality. I’m currently involved in a research project that is using a HAES framework to investigate interventions on a single individual. Justin Doolan, our participant (who is also a member of the research team under our methodology, community action research) is a local secondary Dean. He was approached by members of staff, whom shared their concerns about his weight, and encouraged him to make an effort to lose weight. He approached Massey University, and my team presented a different approach to him: Instead of helping him lose weight, we would help him achieve better health, independent of weight loss. Our team of researchers (pulled from the faculties of Human Development, Nutrition, Sport & Exercise, and Management) are working together to facilitate a programme that addresses Justin’s needs, likes, and goals within a framework that rejects consideration of weight. We are monitoring his physical and psychosocial health, and working with him to adapt his health behaviours and improve his health measures. 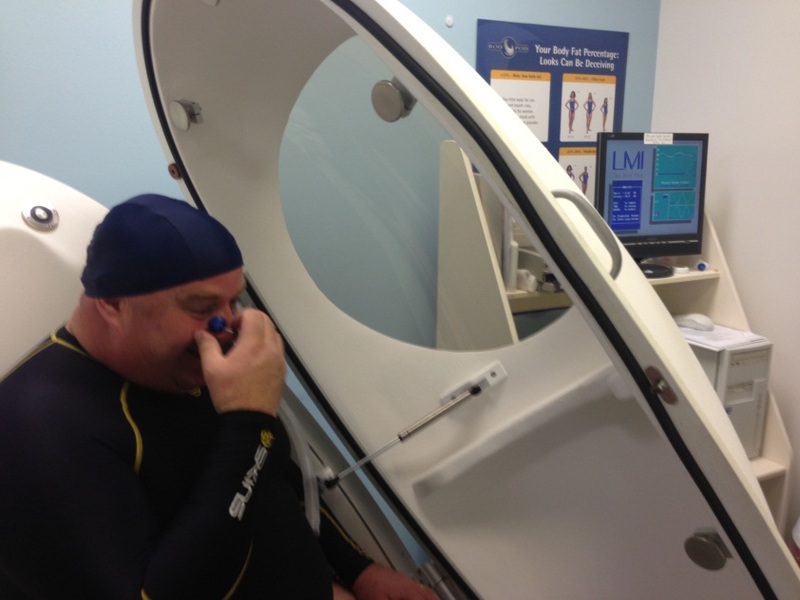 Physical health is being assessed using a range of measures, including blood pressure, arterial stiffness, bloods (lipids, glucose, IL-6, TNF-α, CRP), abdominal adiposity, as well as a range of anthropometry measures (waist circumference and body composition using a BODPOD). The BODPOD measures total body composition and lean body mass. An array of physical fitness measures are also being used, including a submaximal VO2 test, strength tests, and tests which assess flexibility. A range of food tests, and food activities, have been conducted by the nutrition team. Activity sessions have been structured that allow Justin to partake in movement he enjoys, within his schedule, that allow for lower risks of morbidity and mortality. On the psychosocial side, team members are working with Justin to explore (and often revise) his conceptualisations of fat identity, masculinity, embodiment, weight anxiety, internalized fat oppression, and other issues that arise. The end goal of this project is to improve Justin’s overall health. We are working to improve the relationship that Justin has with food, physical activity, and his body. It is about learning to recognize the body’s signals of hunger and satiety, independent of counting calories or following a structured plan. It is about enjoying movement as a way to nurture your body, rather than a punishment or a weight loss tool. It is about acknowledging the role that psychosocial well-being plays in holistic health. Very few of us have an entire team of PhDs behind us, but there are many small steps you can take if you wish to usher in health seeking behaviours in 2014. So first things first, toss that scale! Tossing out the scale is one way to acknowledge that your goal is not weight loss, but improved health. And if you really need a scale in your house, buy a Yay! Scale.